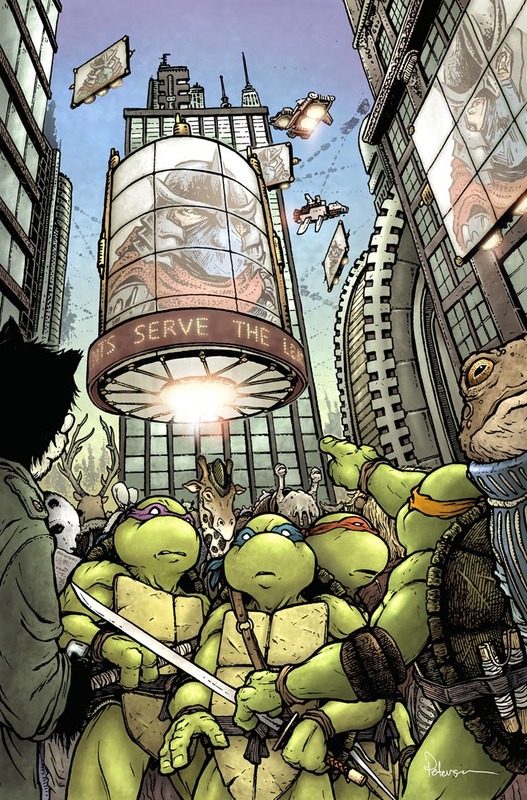 In the final issue of IDW's Turtles in Time series, the four turtles arrive back in Manhattan....but is it the Manhattan they know? This is the near-future...or an alternate near-future. When my editor Bobby Curnow told me the issue would be set in the 'future' my plan was to have the turtles trying to fit in and pilot a small 2 seater flying car amidst odd tech-architecture and holograms. But then I was given more info on the script and what this specific version of the future needed to resemble. To the left you can see the final cover, but below, I'll go through each step of the process and describe how this piece came to be. 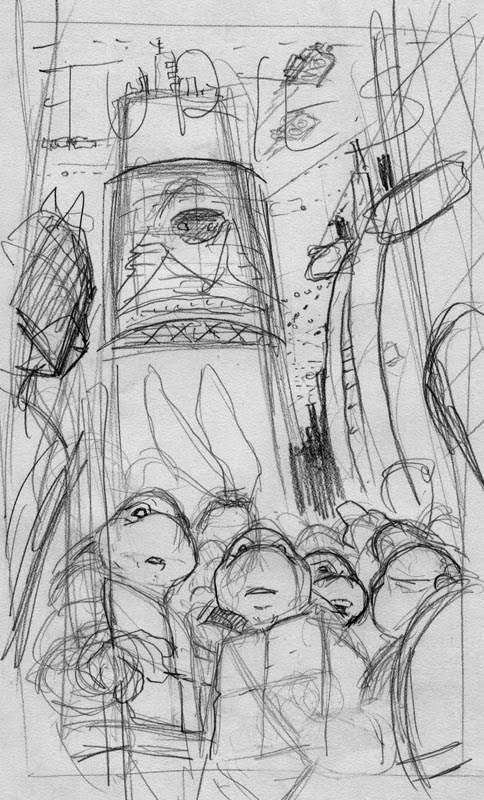 My initial rough was to sum up and force in the elements that needed to be there per the script and Bobby's request: All 4 turtles looking a bit baffled, a blend of current and future architecture, mutants milling about the streets, and some kind of billboard or jumbotron of future Shredder. This was a rough sketch done at a friend's house on scrap paper as I tried to describe to the friend how I was going to fit everything in. 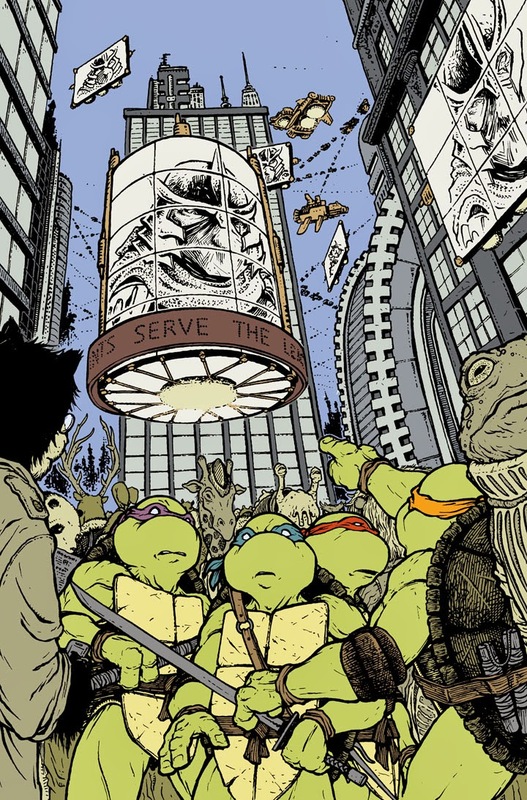 On a tall-format cover like this, showing the vertical trust of the buildings is easy, but fitting 4 turtles across the width and still having space to show that the crowd isn't human, was the trick. Once I knew roughly the layout, I needed I started redrawing elements from the original sketch to tighten it up to show Bobby and in turn he could show to Nickelodeon. 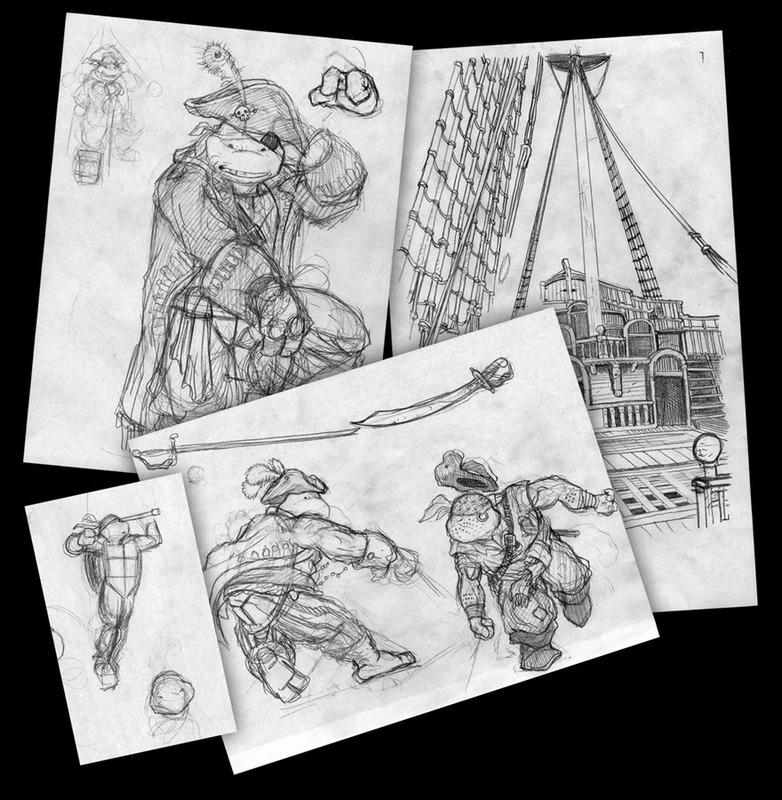 I drew each of the turtles separately in my sketchbook as well as drawing the background on another sheet of paper. This way I could carefully position & resize each turtle, taking advantage of the negative spaces between their shoulders, pointed arms, etc. to fit in all the info needed for the 4 to be shown while still having enough room to get my foreground and background mutants in there. As you may notice, the jumbotron Shredder ended up being a photographed model I made. Instead of any of the billboards or the main jumbotron being fixed to anything, I opted for them all to be free-floating techno-marvels. For the round one (the point of focus), I thought the perspective of not only a circular screen and tech, but also the shredder image mapped on to it would be easier to do with a model. 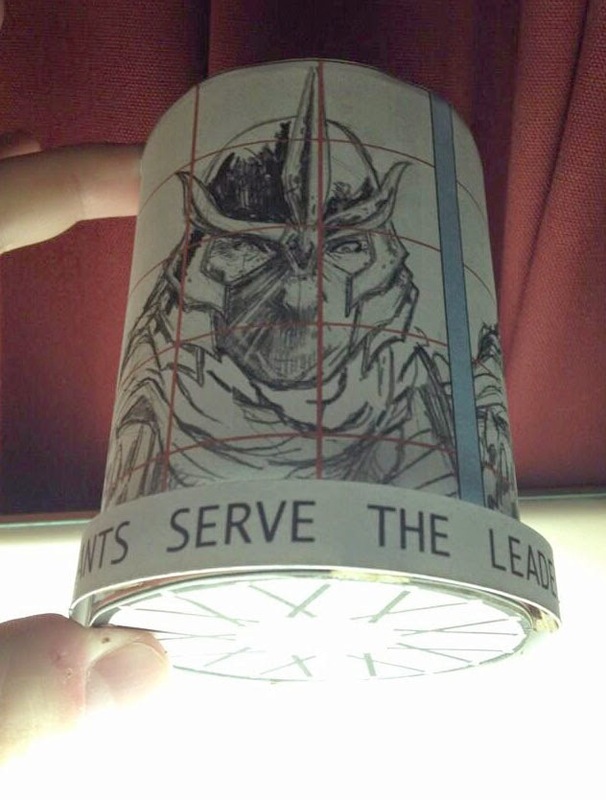 The shredder drawing was scanned, had a grid applied, and then I rolled it up and glued a ticker-tape ring ("MUTANTS SERVE THE LEADER") to it and a spoke & hover-engine design to it. The above digital composite was printed out and taped to the back of a sheet of Strathmore 300 series bristol. On top of a lightbox, I inked the image onto the surface of the Strathmore bristol using the printed image I could see through it as a guide. I didn't have the perspective correct for the background in my rough, so I made a correction before committing to ink (though the center area of the furved building to the right still has incorrect vanishing points. The inks were done with Copic Multiliners (the 0.7 & 0.3 nibs mainly). The inks were then scanned and I started the coloring process where you establish all the various areas as flat colors with no rendering (and often times not the final colors themselves). After I flatted in the colors on the turtles themselves, I tried to keep the other elements simple, making a 3 tone variation for the buildings and the mutants. Bobby said Nickelodeon was nervous that the turtles might get overshadowed by the foreground characters, so while these were not exactly the final color choices, I did keep in mind that I wanted the turtles to be the most vibrant of the citizens and the others should be kept more muted. Here is another look at the final cover art with the rendering and the special effects for lighting added. It's been a fun run on TMNT. 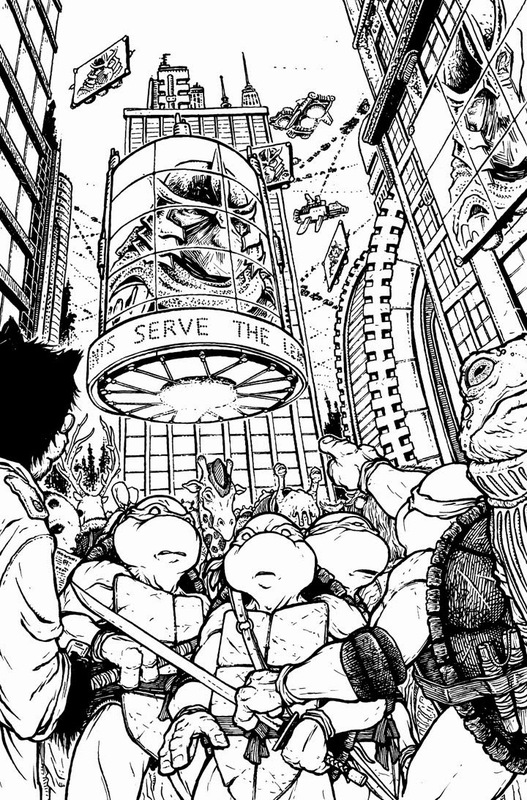 While I don't have anything else lined up with IDW currently, I do hope to come back and do some more with the TMNT sooner than later. A new book from Archaia parent company BOOM! 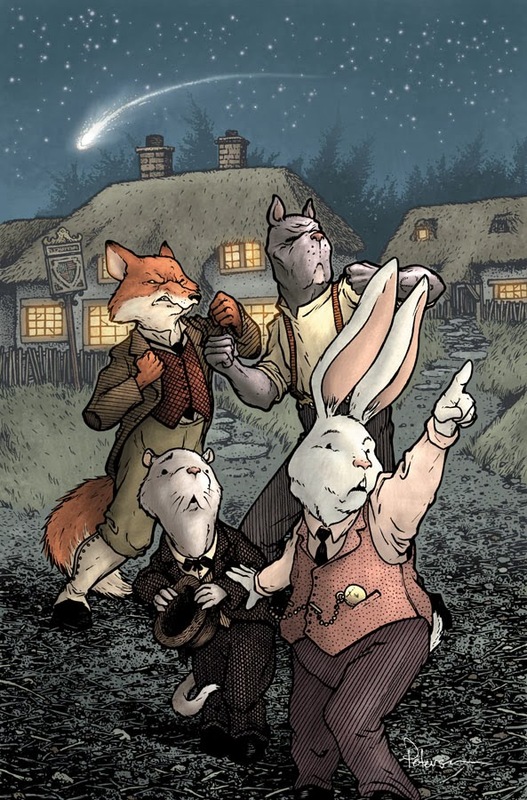 will be coming out soon called Wild's End by writer Dan Abnett and artist I.N.J. Culbard. The elevator pitch is "Wind in the Willows meets War of the Worlds". So when the editor pool in the Archaia/Boom! 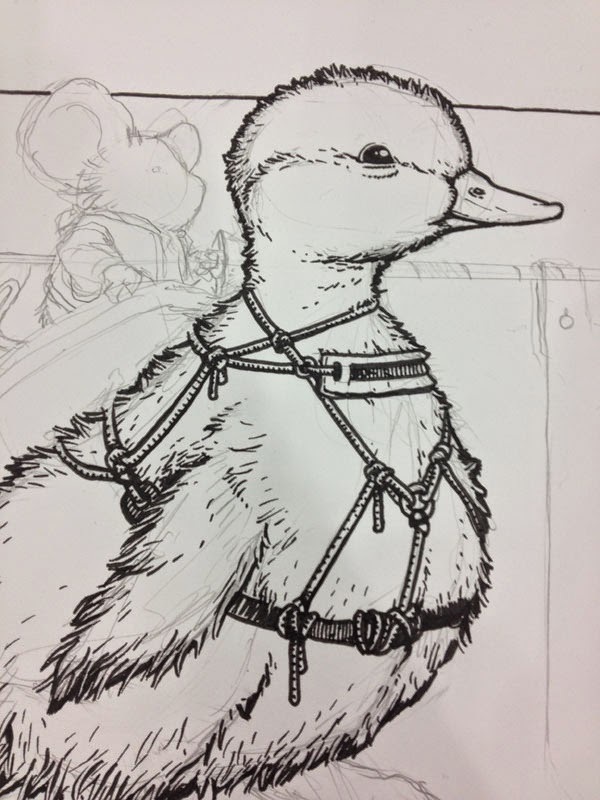 offices asked if I'd be up for doing a cover, I said "Yes, please"...because how can you go wrong with talking animals in clothes? I'll be purposefully vague on the details of this book and the story, because I'll let BOOM! 's marketing make sure they control how that info is released. (more can be found in this interview on CBR) To the left you can see the final artwork, but in today's blogpost, I'll walk through the process of making the cover art. I was given a script of the first issue and some character control art (shown here on the right). For the first script, I decided to focus on a moment towards the end of the issue, though I combined a few things all happening at once for the sake of trying to get a lot of story info into the cover. 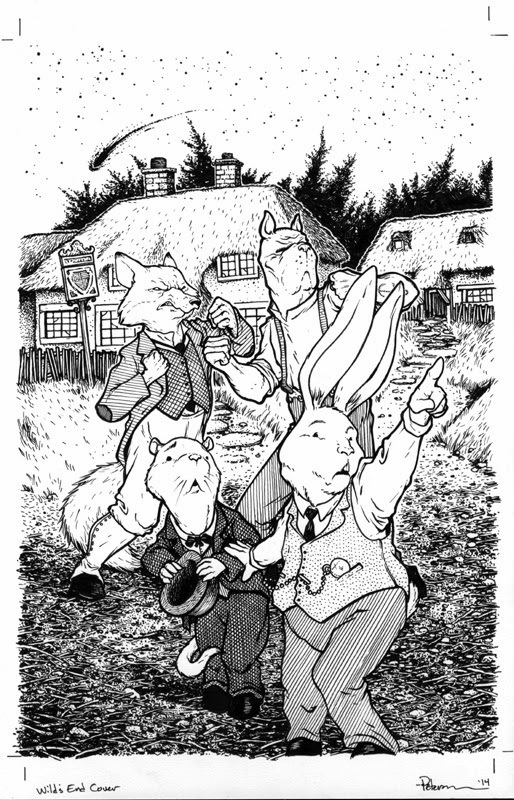 There are four characters in that scene: A dog, a fox, a Rabbit, and a Mink. In my original thumbnail I sent to BOOM! 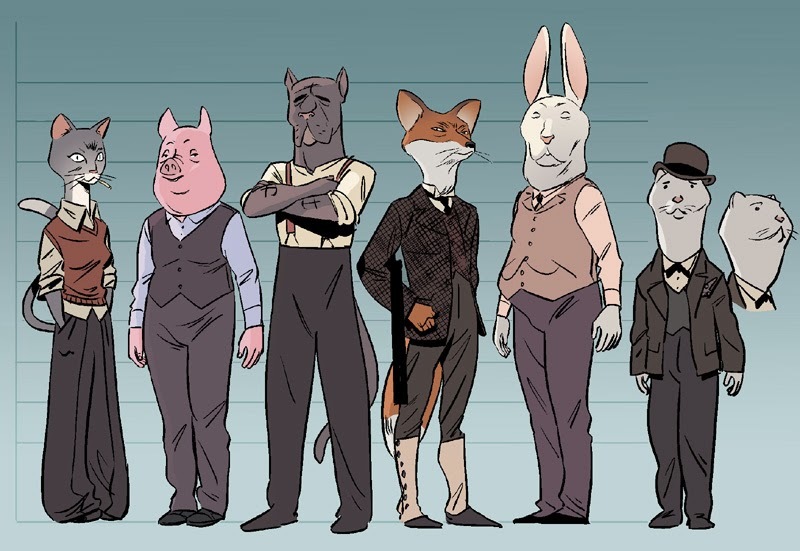 I'd omitted the mink for the sake for trying to fit everyone, but 1) this layout had some flaws which fixing would open some space and 2) the creators and editors really wanted the Mink in there. I sketched out each character in poses I figured would work for the scene. 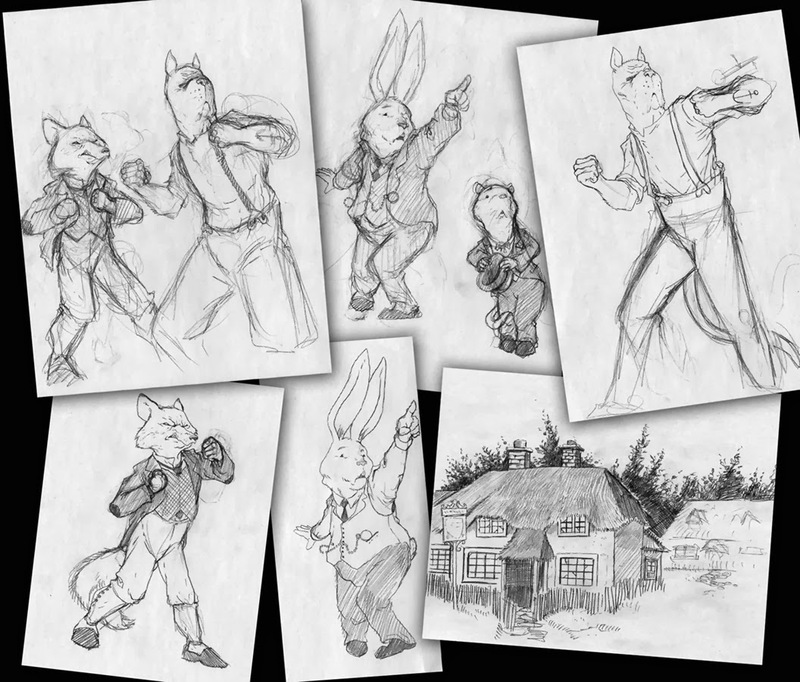 With a few of them, I revised the poses and details by placing my original sketches on the lightbox and tracing over them on a new sheet of paper. I was going by descriptions given in the script for the character's personalities (often comparing them to past and present actors) as to how I'd present their body language and facial reactions. In this series of sketches, I also drew up a tavern for the background. I'm finding I feel more free doing these on separate sheets of paper rather than in a sketchbook...if a drawing isn't going well, I can scrap it easier than if it was in something bound together. I scanned all the rough sketches and assembled a digital composite layout in Photoshop. By doing this, and having each character as a separate manipulate-able layer, it's easy to scoot all the parts of the composition around like an elaborate collage. The characters are all tinted different colors to help me see them better in this process...where one character ends and the next begins...or what negative spaces are formed between them. The yellow and orange borders are guides for what is the 'trim' and 'bleed', which are terms for where the page is cut (trim), and where you want to extend the artwork to so that if the trim is a bit off, there won't be a white edge showing with no artwork (bleed). I printed the digital composite layout and then taped that printout onto the back of a sheet of Strathmore 300 series Bristol. 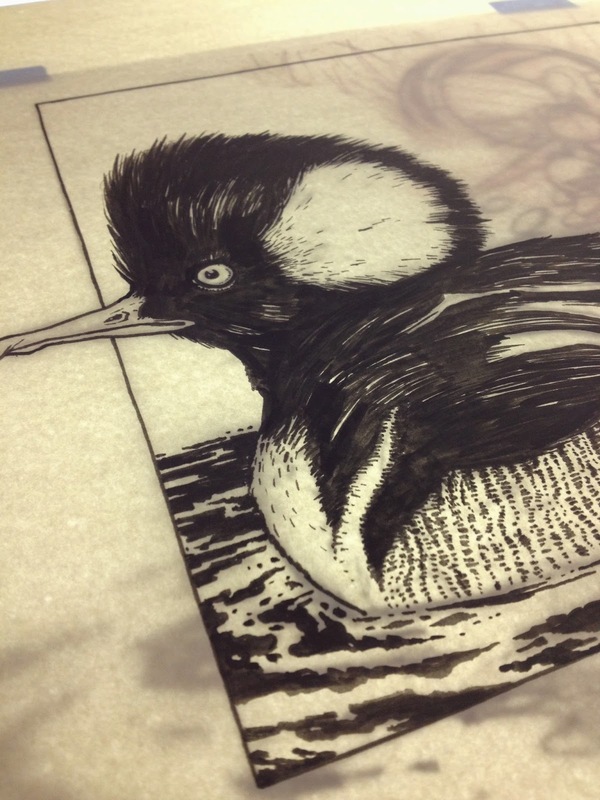 Using my lightbox, I can see through the bristol and used my printout as a guide to ink from. I occasionally will still do a bit of penciling on the bristol surface when I feel my rough is too rough and needs a bit more tightening before I commit to ink. I used Copic Multiliners (0.7 & 0.35 nibs) to ink this piece. Even though the trees, stars, and shooting star/comet were all going to be a color in the final, I had to ink in the shapes solid black so I had something to work with in the coloring stage. 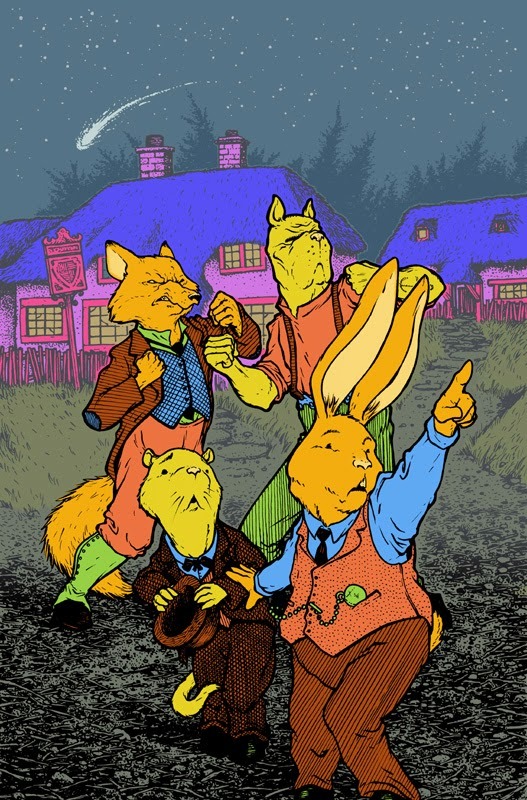 The first part of coloring (after scanning the inked piece and cleaning up the white/black levels) is called flatting. It's because the purpose is not to worry about rendered colors or shading, or even proper color choices. It's goal is to block in various color areas so they are easy to re-isolate when it is time to choose proper colors or render an area. Here are my color flats on the right. I went with pretty wacky colors as I filled in my various areas. For me, each color shown here is also different layer (labeled things like 'clothes 1', 'clothes 2', 'animals 1', 'details', 'sky', etc...). 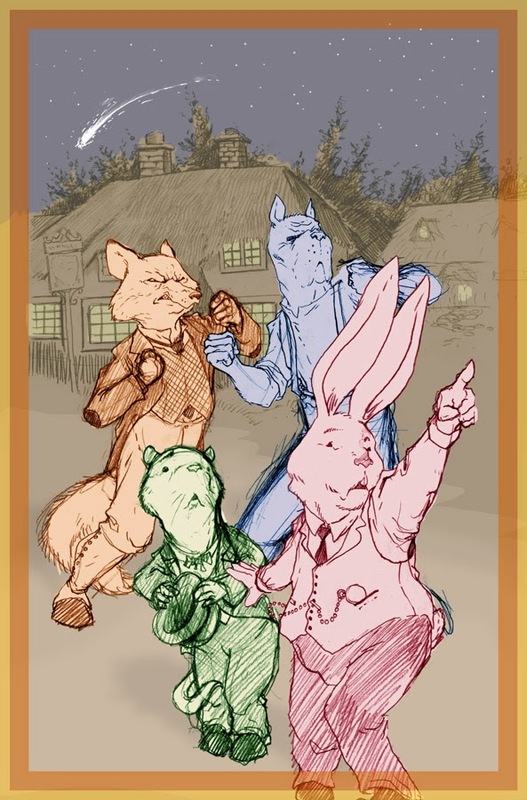 I also established the color holds for the stars, comet, and trees as well as a lightening of the linework for the background ground and tavern as it goes further back. Using the character guide and picking a few colors of my own, I finished the piece and rendered in the shadows and highlights using the dodge and burn tools in Photoshop. To the left you can take another look at the finished cover. And I'll offer up the original inks for sale in my online store later today. This week I'm sharing some of my recent commissions. This first batch was from C2E2. 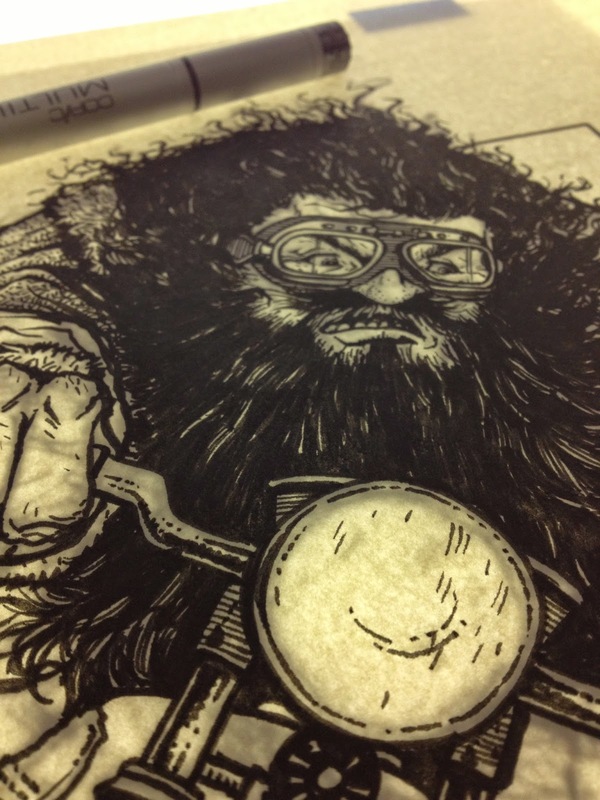 Harry and Hagrid from Book 7: The Deathly Hallows. 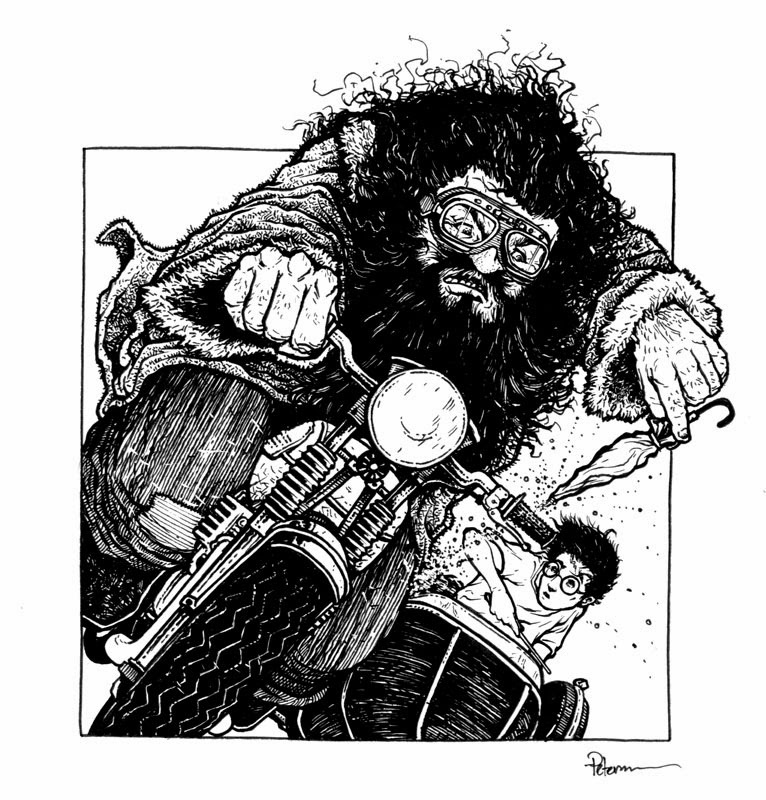 The commissioner originally requested a moment after this when Hagrid has leapt off the motorbike and Voldemort is in pursuit, but as a composition I felt the moment before when Hagrid is trying to repair the bike & sidecar was more interesting. 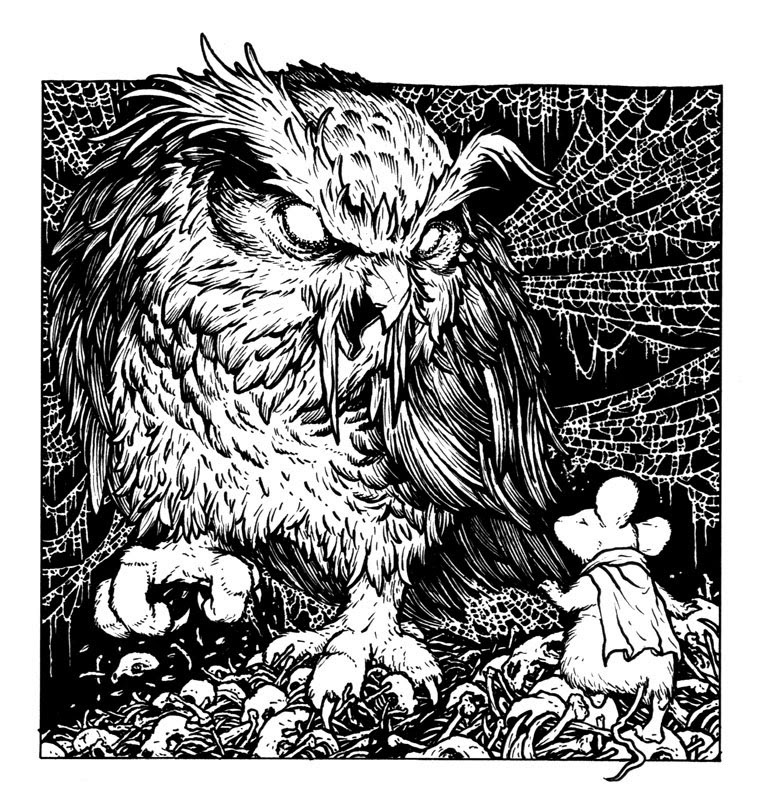 This was rather straight forward and only took a little bit of work to modify my style of drawing owls and mice to something more like the animated feature designs. 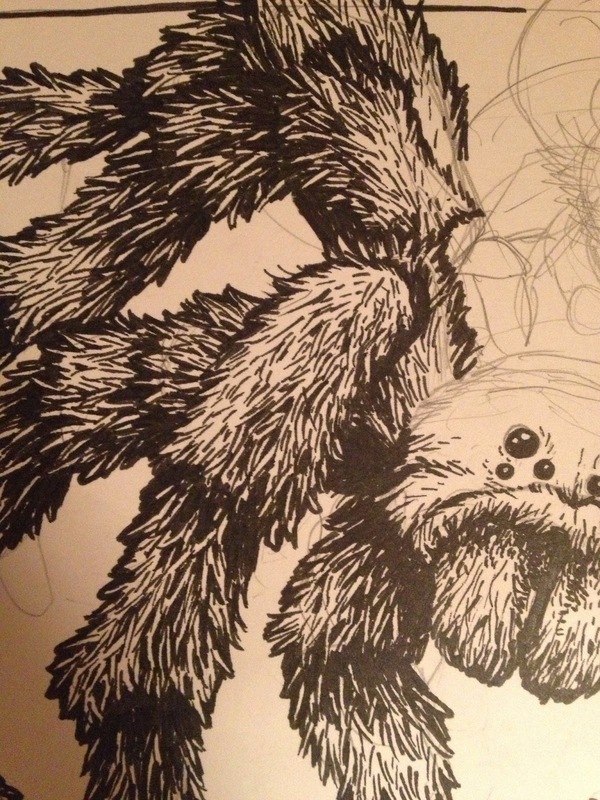 The webbing was almost entirely done by inking in the space between the web rather than going back in with white. The commissioner hopes to get on my list a total of 3 times for a sequence of images. 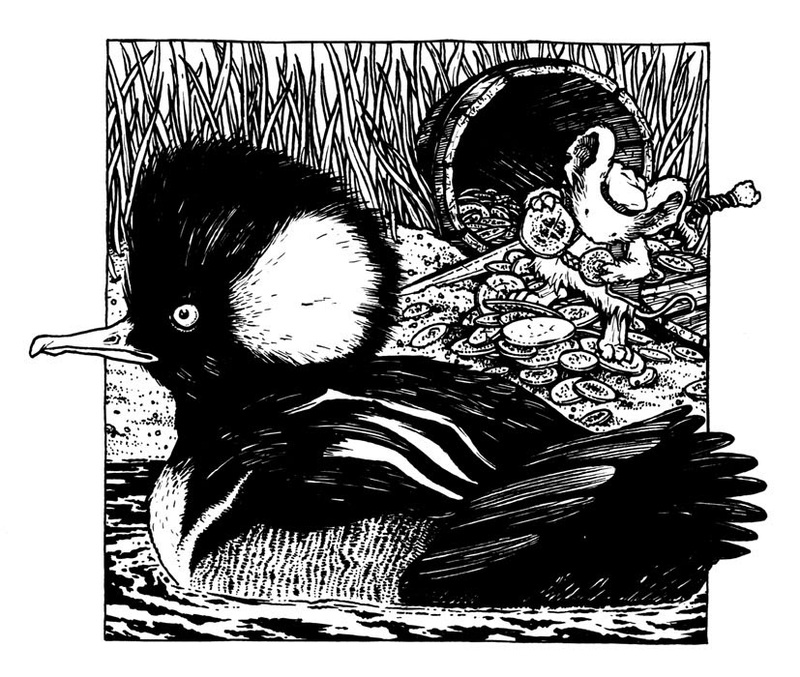 This being the third where the mouse and duck have discovered and collected an under water treasure. 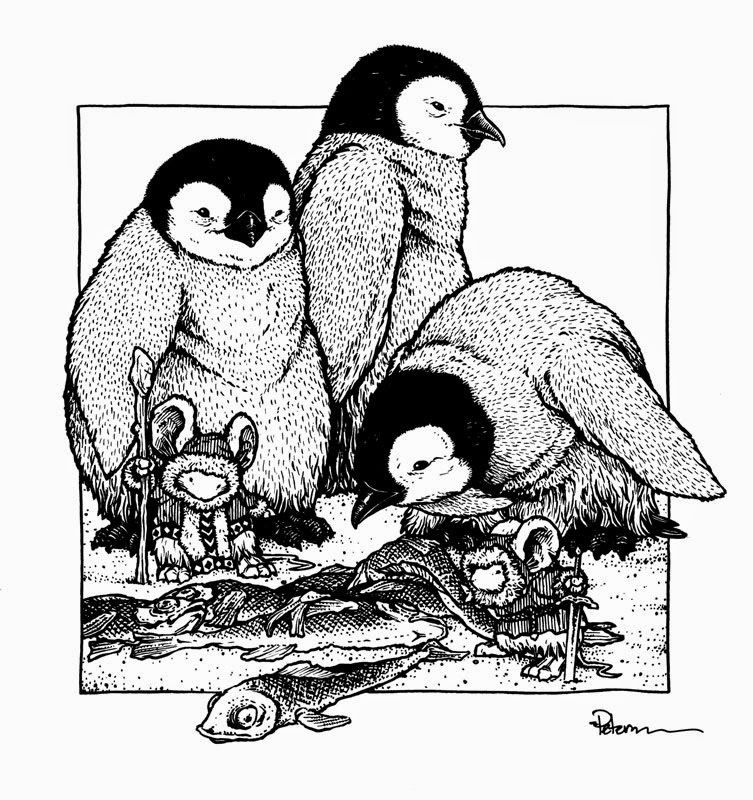 The commissioner requested a group of these chubby cute penguins with Saxon and Kenzie in appropriate gear for a visit, with perhaps the penguins giving them a gift (the fish). 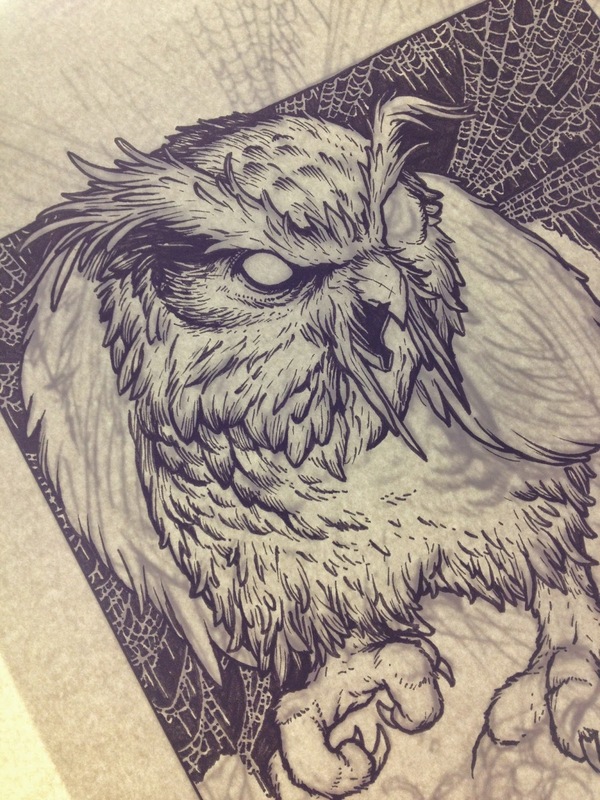 Unfortunately I didn't take an process photos as I inked the piece. 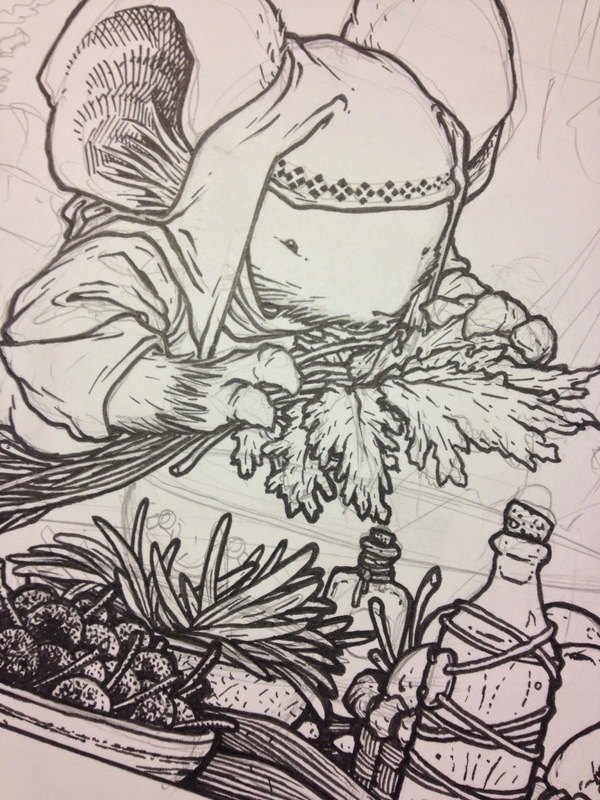 I have a Mouse Guard story with a cook coming up and I needed to design her look and costume. 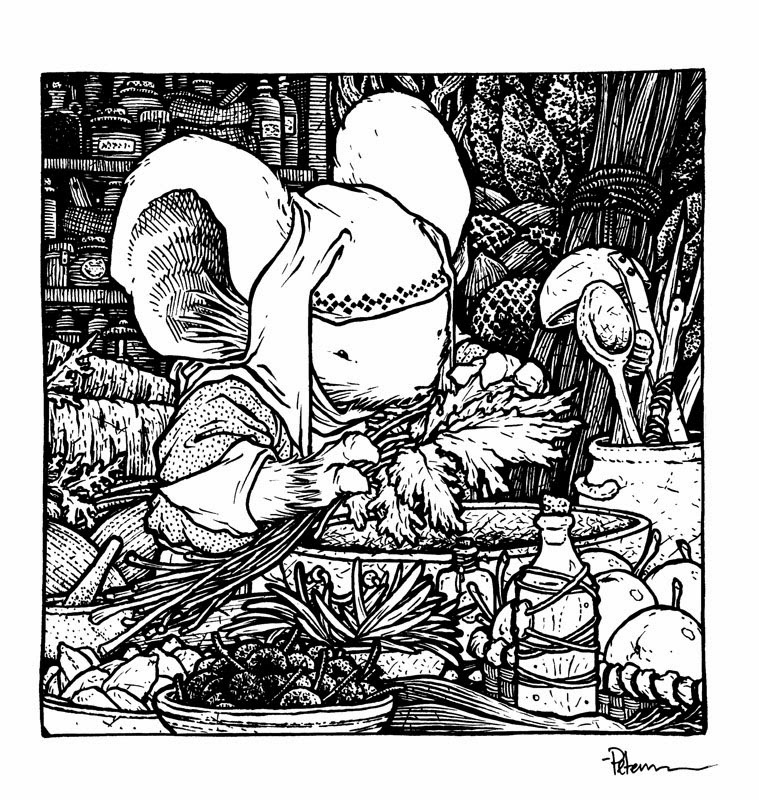 Plus I thought it would be fun to explore the ingredients a mouse cook would have at the ready: Coriander, seeds, wild onions, acorns, berries, carrots, rosemary, peppercorns, etc. Again I needed a character design for a Mouse Guard story, this time a rough, rugged, and battle scarred veteran hunter/warrior. 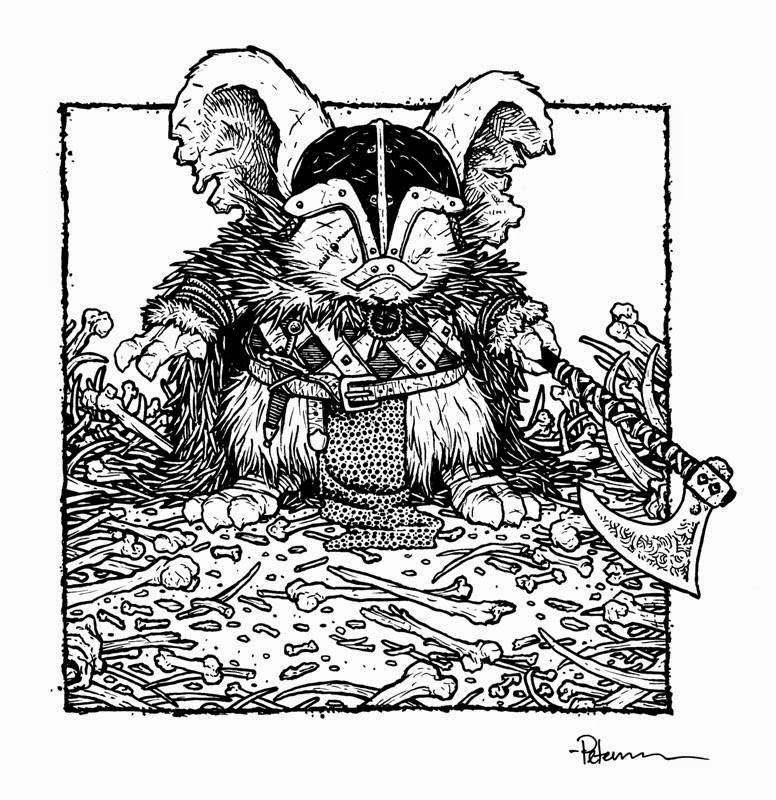 He is scarred and his ears are tattered, his cloak is one of something else's hide, he wears leather and chain armor, and a weapons that can only deal death: an axe. i enjoy drawing bones and thought it was fun to have them not fill the space, but act as a gradient and get more dense near the edges. After two character designs, I thought I should do something with no purpose and a bit of a story implied. 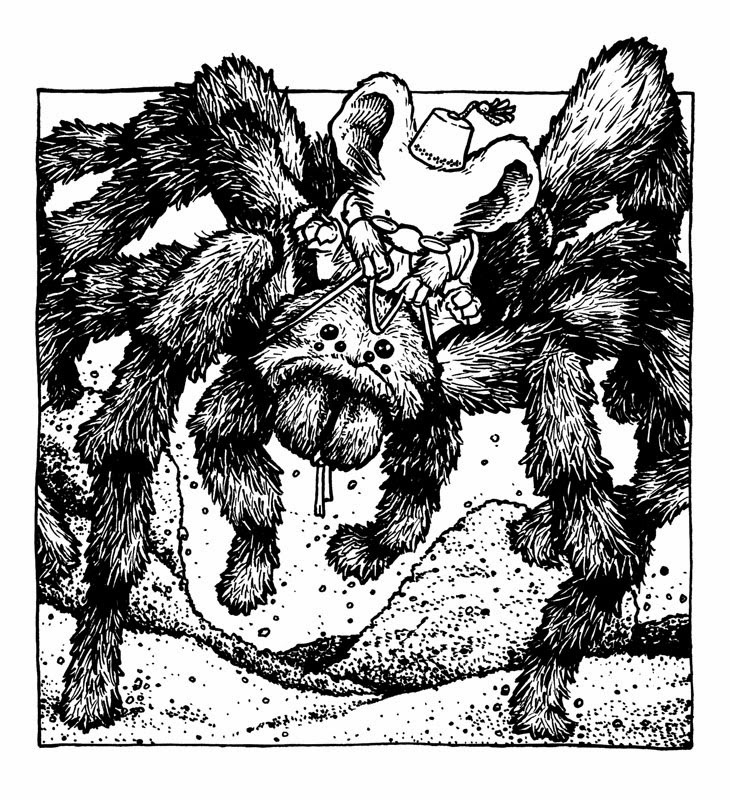 This was just for fun because I don't know that you would ever see a tarantula in Mouse Guard (not the right region). And while I say there is a story, it's an implied story for you to imagine, I have nothing specific in mind. It had been a while since I'd drawn the Fall 1152 villain. 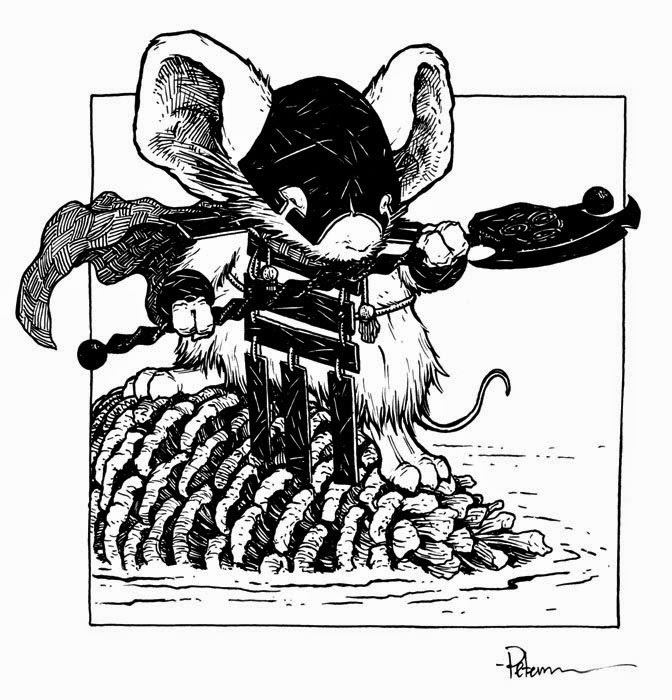 This piece was more about pose, and a pattern of large black shapes and large white negative spaces than it was about a typical Mouse Guard panel with detailed background or implied story. I was asked by someone about how mouse children are/would be depicted in the books since real mouse babies are hairless, pink, and not very cute. 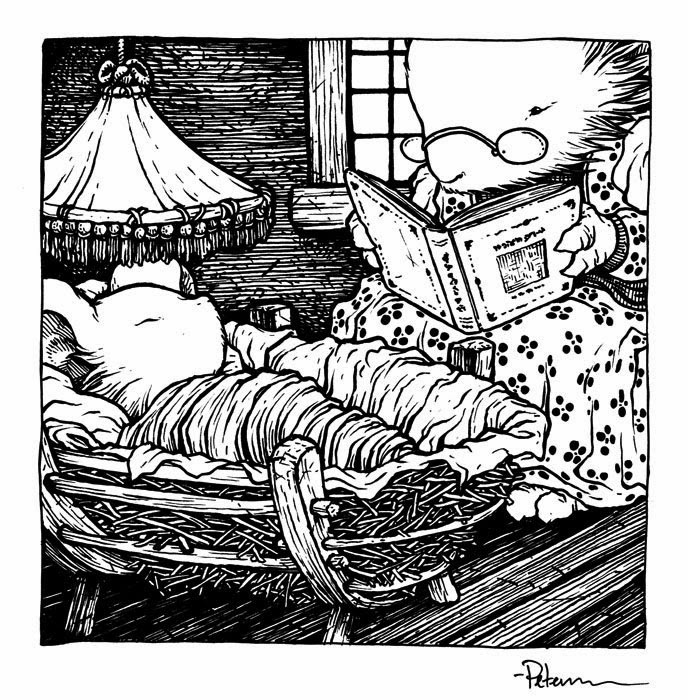 Real mice do get cute quickly, so I think almost every child portrayal I've done so far synchs up with nature in that way...but It got me thinking how I'd handle a little baby...and then I just wanted to draw a mouse-made crib. Unfortunately, no process photos of this piece. 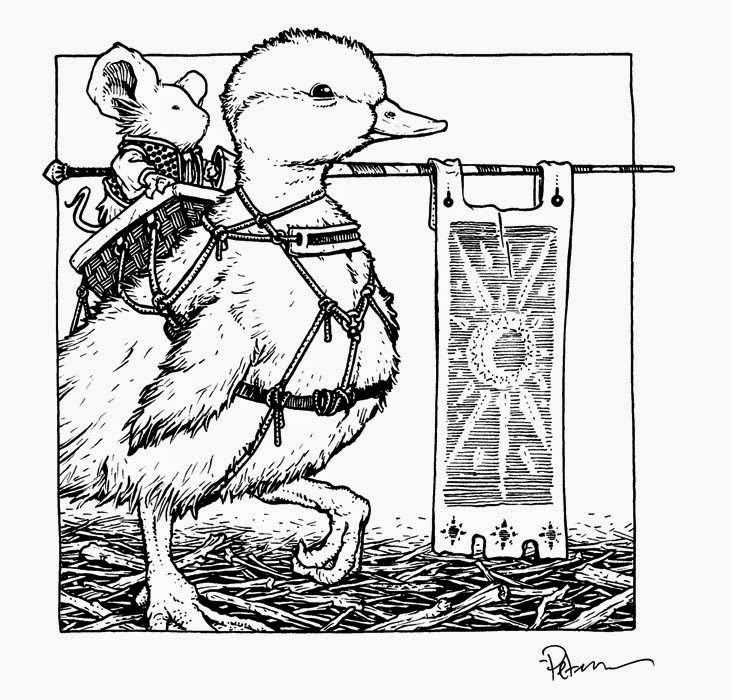 While at a convention and thinking of birds I have yet to draw in Mouse Guard (or for commissions), a duckling came to mind (though I have drawn a gosling). And I thought it might be fun to do an Atari Joust homage and give the mouse a lance. I may have some more pieces like these for my remaining June shows if I have the time. Hopefully I'll be able to open a commission list for SDCC. If I do, I'll post on Facebook and Twitter that I've opened up the list in my online store. The pieces must be picked up at the convention. 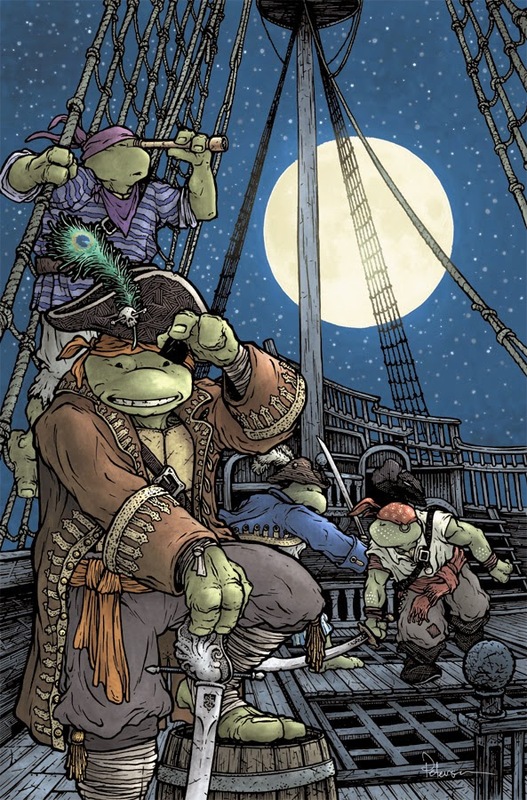 In the third issue of IDW's Turtles in Time miniseries, the four brothers find themselves on a pirate ship! When editor Bobby Curnow originally pitched me the 4 issue lineup, the third issue was in a bit of flux for the setting....WWI and the Old West were both tossed around and I had visual ideas for how to handle both,,,(bi-planes and trains!) But when the series solidified, Bobby emailed "PIRATES!". 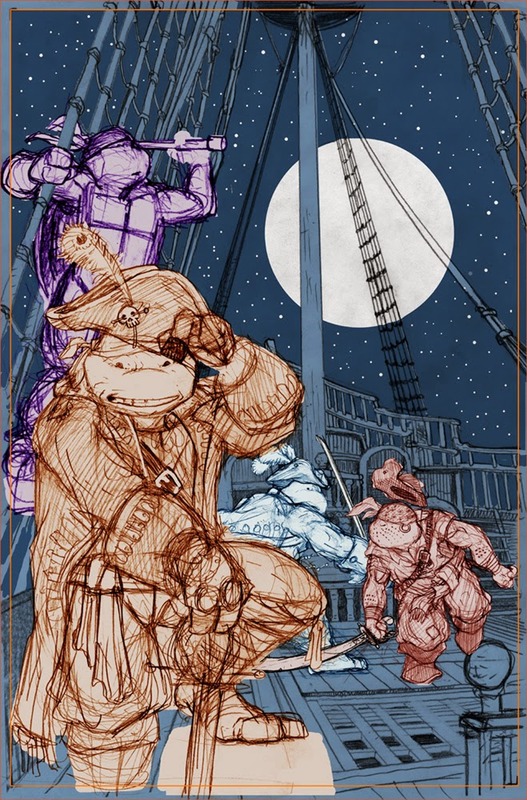 And I was off to doodle and research (even calling on my pal Jeremy Bastian for piratey-tips) for a swashbuckling ninja turtles cover. To the left you can see the finished art, but below I go into the process it took to get there. Those pencil drawn elements were all scanned and then assembled in photoshop to come up with the layout of the cover. At this stage, I made a few adjustments where I'd drawn heads too small, replacement hands to patch in, and swords to angle correctly to avoid bad tangents. The colors were added not just to help me see the drawings better (where one character ended and the next began) but also to show my editor and Nickelodeon as to which turtle is which. 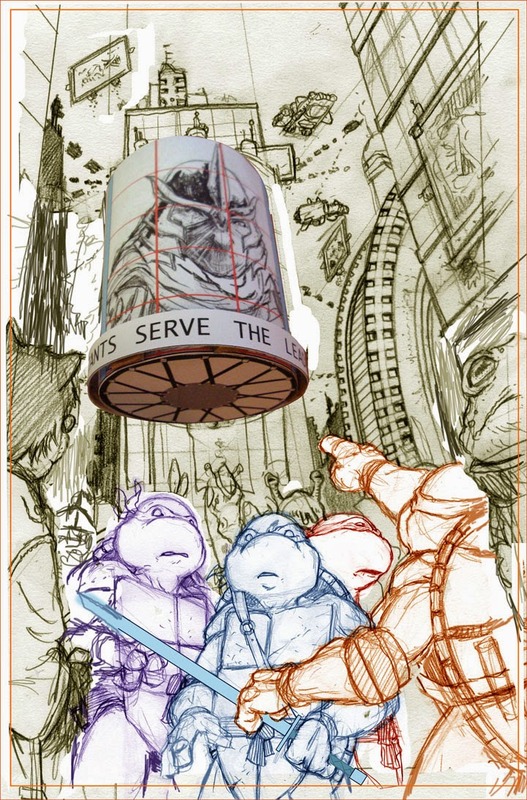 This is now my secont TMNT cover where I have shown them all without bandannas or their traditional weapons (though for #2, Leo did have a katana) and I found it fun trying to show some of each turtle's personality in other ways...though their bandanna colors do play a part again later on. The digital composite, once approved by my editors, was then printed out at roughly 10" x 15" and taped to the back of a sheet of Strathmore 30 series bristol board. I inked with Copic Multiliners on my lightbox. Using a lightbox allows me to see through the surface of the bristol to the printout and use it as a guide instead of pencils on the surface of the bristol. This means less erasing and cleanup when I finish the inks. The stars and moon were inled in black, though I knew I was going to adjust them to be light lines in the color process. 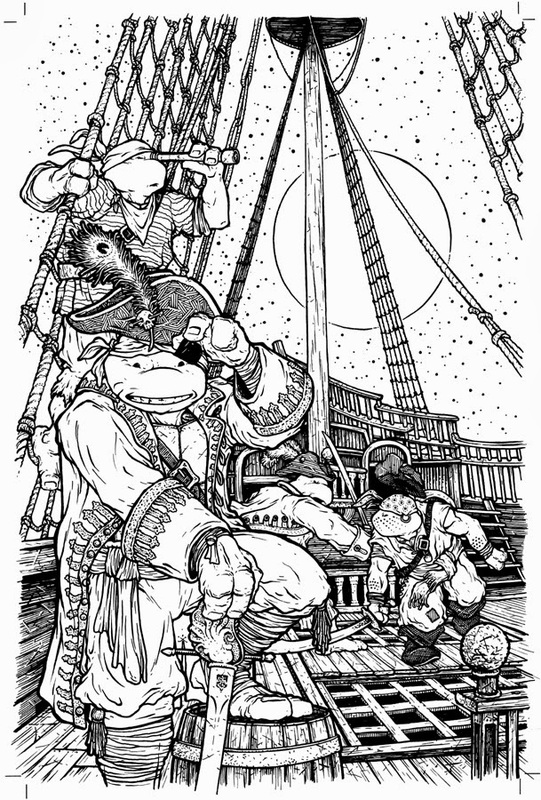 While I was inking I realized I'd never drawn pirate garb on Don in my rough, I'd only drawn him in the pose I wanted. 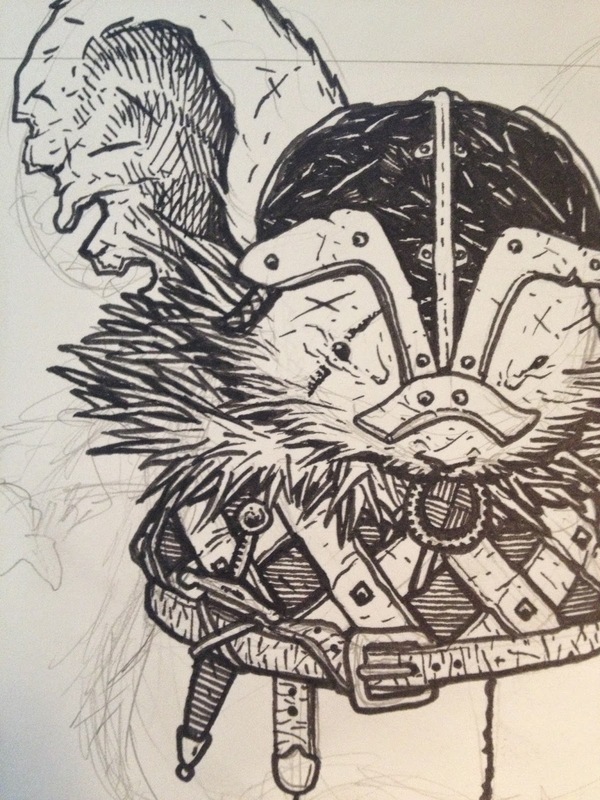 So I had to quickly do some last minute design and penciling so I could finish the piece. To start the color process means that I must establish color areas. It's a way of isolating parts of a drawing as each being different colors than others. This is called flatting (because you aren't rendering or shading, you are just filling in flat colors. I used a lot of high-saturation basic colors to help me see that I was establishing areas that may be next to each other as different colors. Once I got to this stage of the flatting, I desaturated (removed all color information & turned to greyscale) all the layers (other than the sky, ship and moon which I knew I'd gotten close to final colors for. Like issue #2 of this series, I had to incorporate each turtle's bandanna color into their wardrobe to help the readers quickly establish which turtle is which beyond their body language. The final colors can be seen again below.